A country in Central America, Costa Rica, along with several Central American provinces, declared its independence from Spain in 1821. In 1823 the country joined the United Provinces of Central America. 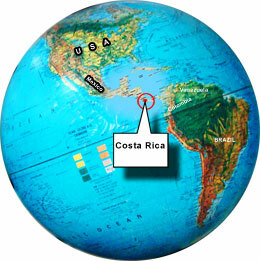 However, with the disintegration of the federation in 1838, Costa Rica became a sovereign nation. Barring two incidents of violence the country is a peaceful one and is reputed to have been the first country in the world to constitutionally abolish its army. Though contribution of agriculture to its economy is large, tourism and high tech industries are also making their presence felt in a large way. Its strategic location in the Central American isthmus has been one of the most potent reasons for the expanding business. A famous eco tourism destination, Costa Rica has been attracting for its serene beaches, dense rainforest and striking wildlife. Ccontaining 5 % of the world’s biological diversity, the country boasts over 15 different ecosystems. Its several national parks and biological reserves including the Monteverde Cloud Forest Reserve are inhabited by a wine number of birds, mammals and reptiles. The Wilson Botanical Garden is home to more than 1000 varieties of plants. The Parque Nacional Santa Rosa and the Butterfly Farm at La Guacima are other attractions. The nightlife of the capital city San Jose is another attraction for modern traveller while you can relax at the idyllic beaches on Peninsula de Nicoya.